I attended the first lecture of a six-week continuing ed course at St. Mike’s this morning. The title is Teresa of Avila I: World and Life. The suggested reading is her spiritual autobiography titled The Life of St. Teresa of Avila by Herself (or a variation, depending on translation). The instructor is a spiritual director and retreat leader at a local Jesuit retreat centre. She seemed very knowledgeable and we got some background on the genesis of Teresa’s autobiography (why did she write it? for whom? what constraints did she face? etc). I had read the first quarter of the book and found the information very useful in understanding her style of writing as well as the content. The course was held in a seminar room that became standing room only (well, sitting on the window ledges). There were 25-30 people there, including 3 men and 4 nuns in habits. The rest were mainly women my age and older. I arrived rather early as I wasn’t confident that I knew my way around campus, and another woman plunked herself down beside me and started chatting. She had been on a pilgrimage last year that included a visit to Avila. During the course, though, she seemed to zone out, and spent a good deal of it flipping through my copy of the text. 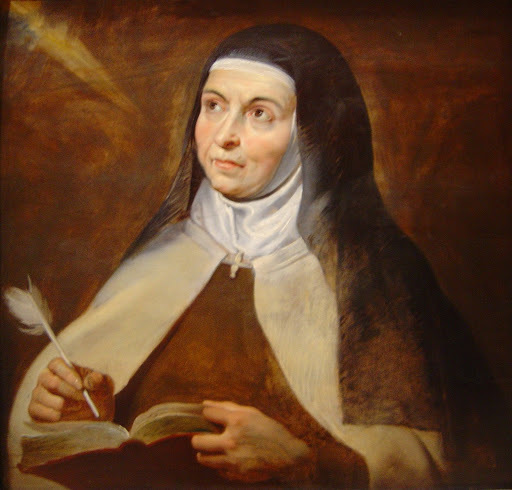 Teresa lived in the 16th century, at the height of the Inquisition and the beginning of the Reformation. Women’s voices were suppressed and they typically were denied much formal education. There is lots to learn about this time, and it looks like it should be a great course. Next semester the same instructor will teach a course that focuses more on her mysticism/spirituality, based on her book The Interior Castle. Depending on how this goes, I’ll likely sign up for that one too. Sounds interesting. St. Teresa of Avila is one of the Saints that i really would like to learn more about myself. Keep us updated!